Watch: Communication for collaboration - ThoughtForm, Inc. In this Formulations interview, Norm Goldberg, ThoughtForm principal and design strategist, speaks about the importance of collaboration in the new business environment. He details systems and processes that you can use to foster better collaboration, and tips for better interpersonal communication. Read through his thoughts below. “I think it’s especially important today, more so than it ever has been. It’s really about disruption. A lot of that comes from digital technology which has disrupted business in so many ways: opening new channels and markets, opening or obsoleting business models very quickly, shifting value from traditional skills to new skills, making data and information available in more ways that it ever was. Everything is changing and the legacy norms of business are continuing to be shattered all the time. “There are some basics. You need a shared goal, you need the right mix of skills, you need the institutional support. But that’s really nothing new. There are a couple of key things that don’t get talked about quite as much, and I’d like to touch on those for a moment. “One is culture. The legacy model for government is you have a strong leader, and a hierarchical structure, and everything goes like clockwork. But it’s really an environment that doesn’t work so well anymore. It’s an environment for the alpha-dog and we find that effective collaborative work really draws upon a personality type that we call the beta-dog. What I mean by that is people who can listen well, facilitate others, draw ideas out into the light for everyone to evaluate. It’s about integration as much as it is about one person’s vision. It’s about respecting and trusting others. Also, it involves being willing to venture something that you might not be as certain about, but that might hold some value. “In fact, Google did an extensive study on what makes for a good collaboration. The concept they decided was more important than any other is what they called psychological safety. Which means that you’re not afraid to say something that might be wrong. You’re not afraid to go out on a limb. You’re not afraid to trust the people you’re working with and to work together with them. We find that’s terrifically important, and we try to cultivate that here as well. I think as a collaboration leader you need to set that cultural expectation. The legacy model for government is you have a strong leader, and a hierarchical structure, and everything goes like clockwork. But it’s really an environment that doesn’t work so well anymore. “There’s one other piece that I think is important, and we call that alignment. We talk a lot about that here at Thoughtform. In an enterprise setting, we’re talking about a team that’s truly working closely in sink and not just in siloes, or even across purposes. James Collins, who I think had a lot to say about how organizations work well, said that building a visionary company requires one percent vision, and ninety-nine percent alignment. So I found that a very striking quote from him. We do find that alignment grows out of clarity about your mission and purpose, which he was also about. And that’s a process, that’s not something that happens in a day. But I can lay out a few key points. The first stage of alignment that we find is: defining the thing that we try to get people aligned to. It might be a new initiative, or a new program. A new product line, or way of thinking. Define it. Where does it fit into my overall work universe? Because, folks in big companies are constantly trying to build a mental model of what’s going on around them in relation to their project. Secondly, why should we do this now? How does it help their fortune, how does it help me? So you have to make it very relevant and relatable to them. That’s the second stage. The third stage is explaining it. Often times, that’s being able to give a holistic, 50,000 foot view, so that you can see all the parts and pieces, and get your arms around it, but then being able to drill down into the details. That may be a different view for different people. “Well let me take that question in terms of interpersonal communication. So just some heuristics. One great thing you can do when you’re in a work group and trying to get aligned and collaborate well, when someone outlines an idea, play it back to them and let them know that you care about whether or not you understood them, and make sure you did understand them. “Another one is, when you like something, make sure you say so, don’t forget to because that really adds energy to the group. A lot of times in group work you’ll reach an impasse, you’ll be unable to get past a certain point, you’ll disagree and find you just can’t get past it. If you are a very linear person, that’s uncomfortable, we feel we have to resole this. But often times it’s better to just sort of pivot, circle back to it later and work on something else. Because, sometimes a problem goes away, if it doesn’t you might obtain more perspective to help you solve it. “I find it really powerful to speak in conditionals, we talked about how really today, solving problems requires creation. Conditional phrasing helps people imagine, so you can say, how might we approach this piece of the problem. How might we make the customer feel satisfied in this situation. Next up: Watch, Communicating Change, with ThoughtForm’s Director of Marketing, Marisa Boevers. 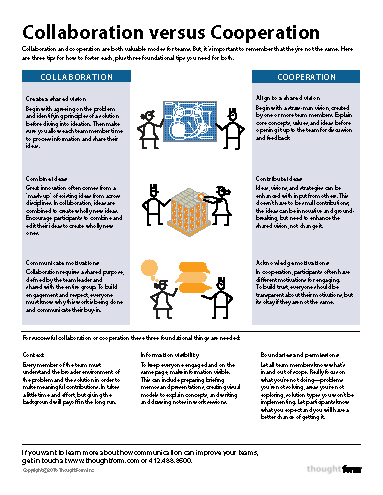 Download this illustrated white paper to learn how to use collaboration and cooperation.